We’ve just blended our white and rosé from this tricky vintage. 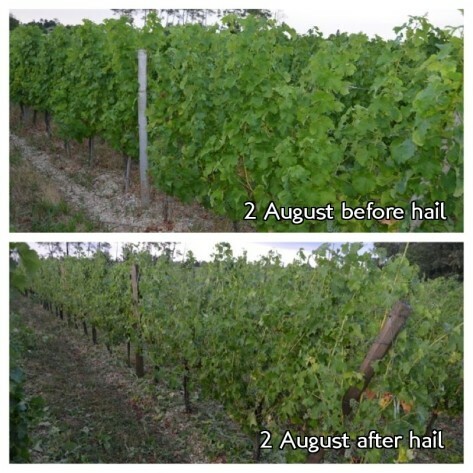 The August hailstorm at Bauduc wiped out half the grapes and we’ve been draconian with selecting only the best of the rest. The pale rosė is excellent but, for the white, we’ve only made 20% of what we hope to produce with our vines normalement*. We’re happy with the amount of rosė – slightly more than last year, which is good news – and the quality is very good. Pale, crisp, dry, gluggable and refreshing. For the white, we are allowed to make 1,100 hectolitres (110,000 litres) from 17 hectares. That’s a permitted yield of 65 hl per hectare (8600 bottles per hectare). I’m fairly confident that we would have made that had it not been for the hail. As it is, we produced half that volume of wine and from this decimated amount, we have selected just 220 hl (29,000 bottles instead of a maximum 147,000) or 20% of the potential yield. This 20% was from vines that were hardly hit. The remaining wine we’ve produced (350 hl) is being sold off in bulk to Bordeaux wine merchants, who make blends for larger, non-chateau brands. We don’t want to compromise the quality by including wine that was made with grapes that just didn’t ripen properly as a result of the vines being hit by the hail. I don’t think they ever recovered from the shock to the system, or that’s how it seemed, and with a much later harvest than normal, the grapes never really had a chance of being ripe enough. At harvest time, when tasting the grapes out in the vineyard, it was like biting into a cooking apple instead of a granny smith. *Normalement is a slightly misleading word that’s often used by builders and the like, as in ‘we’ll be there tomorrow, normalement.’ It means ‘hopefully’ or ‘all being well’, not ‘normally’. The 2013 rosé is pale and lovely. Blending the whites from 2013. 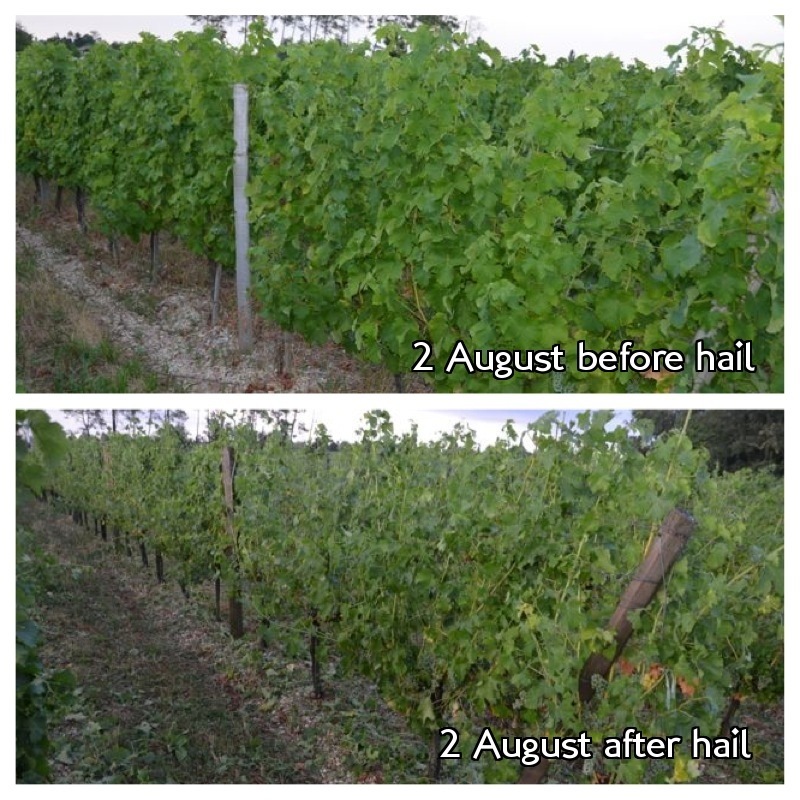 The Sauvignon Blanc we kept, untouched by hail. Machine picking Sauvignon Blanc early on a Sunday. Temperature controlled stainless steel tanks. Smaller tanks for smaller parcels. The 5000 litre pneumatic press. Stainless steel for making white and rosé. 29,000 bottles of 2013 white instead of 147,000. With this gallery of photos, scroll over any photo for a brief description and click on it for a larger image. You can then flick through them (in a normal browser) using the < & > arrows. To return to the post, click the X on the top left. Feel free to leave a comment or ask a question, or share on Facebook or Twitter below.